When Matthew's parents decide to adopt a baby girl from China he has many questions, but by the time she arrives, he is excited about his new sister. 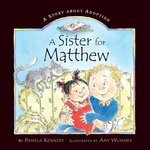 Kennedy, Pamela, "A Sister for Matthew: A Story About Adoption" (2006). DIVerse Families. 19.